Here we would like to offer you some assorted and selected guitar parts. We don´t want to offer as much parts as possible, our goal is to only offer the best parts available that not everybody has. We only offer parts, that we use ourselves, so we have very good experiences with all of this parts and can answer you all of your questions in detail. We stock a lot of parts that we need in the shop to do repairs and custom builds, eg. custom made output jacks, pickup selector switches, bridges, tuners, pickguards and many many more that we can´t list all here. If you need anything like this (or anything special), please let us know - chances are good we have it or can get it for you ! As a passionated flamenco player myself, I tried a lot of different nylon string sets over the years to find the perfect one for me. There are a lot of good string sets available, but none of them was 100% perfect to me. I wanted a set that last very long, intonates well (especially the G-string) and sounds clear with a lot of harmonic overtones, bringing out every nuance of the personal playing style. I talked to a lot of string companies about my ideas and some even tried to tweak their exisiting string sets in this direction, but it failed on the details. At Musikmesse 2015 I had the luck to talk to a manufacturer that was totally open to my ideas and after some test sets I can proudly say, that it´s done ! 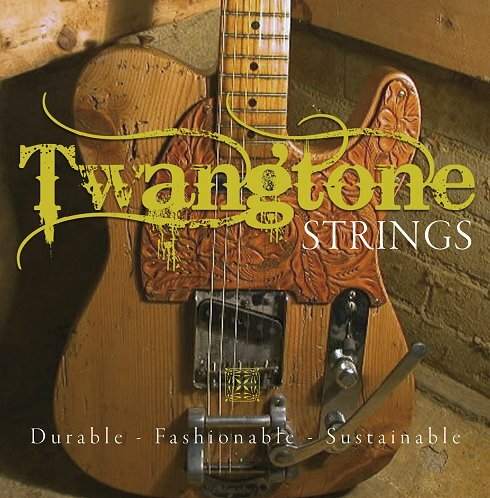 This is the string set I play myself on all nylon string guitars and it is available in two different versions. This is the overall set for all styles of music and you will notice right from the start how your tone will change, sounding so much better than before. You will notice that your strings will stay in tune much better and longer and the set will last more than double the time of what you are used to before you will have to change it. No more troubles intonating the fretted G-string and the overtones and flageolet tones will jump out of your soundboard. The set is only available in medium and high tension, but personally I totally believe that high-tension is the way to go for a good and strong tone. This is a very special version of the nylon string set for all you flamenco players and tailored to your special needs. It´s suitbale for old-style and modern flamenco styles of all kinds and you will be surprised how long this set will last, even if you hit it very hard all the time like I do. For old-school flamenco styles I recommend the medium tension set, while modern flamenco players will like the hard-tension version. The STOCKER from Pacer Concepts is finally here and the ultimate headtsock protector for your guitar. 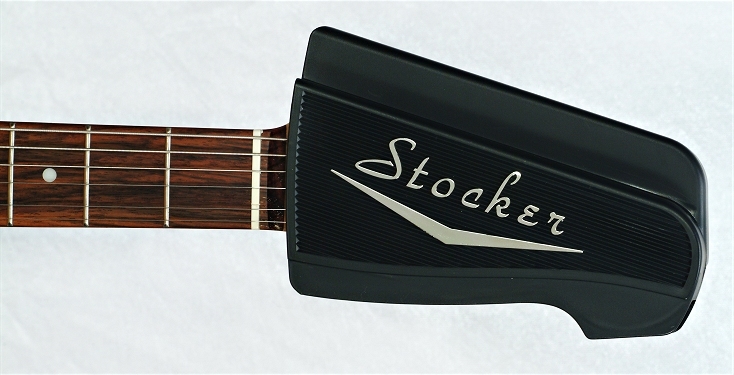 The STOCKER was designed to protect the headstock of your guitar by providing a protective enclosure around the tuner keys. It installs in fractions of a second and is removed even faster. Made of one piece injected molded plastic, there are no moving parts or complicated installation procedures. The STOCKER was invented for professional guitar players with busy gig schedules who are looking for simple solutions for protecting their investment and instrument. - Perfect for students and teachers! Ace, Aria, Axl, Charvel, Cort, Crafter, Danelectro, Epiphone Explorer, Fender, Fernandes, First Act, Gibson, Godin, Hohner, Ibanez, Jackson, Jay Turser, Johnson, Kramer, Laguna, Peavey, Stagg, Tokai, Tom Anderson, Washburn, Yamaha and more. A little calibrated and very accurate analog Hygrometer for instruments that can be used as in-case or stand-alone version. Accurancy is calibrated for only 2% which is great for an analog davice, use the included self-adhessive ring and put it into your guitar case, your guitar or rehearsal room, your guitar workshop, living room etc. You can also use a small screw or nail to attach the Hygrometer on a wall if you don´t want to use the self-adhessive ring. After a short while the Hygrometer will show the exact humidity so you always have it under control by only looking at this small, little device. A must-have for any guitarist, bassist, collector and luthier. You will know the problem, most of us have an individual guitar strap for each instrument, all of them in standard quality or below. Wouldn´t it be great to have only one high-quality strap for all instruments ? Easy to install, great looking, adjustable within seconds and simply the best quality available ? Here it is ... the SLAPSTRAP ! Don´t let the name fool you, it´s also a strap for us guitarists ;-) The Slapstrap is a patented invention of the german bass player Gerald Reese and he had the idea to create a strap, which is made out of finest leather and well cushioned just at the right spot where you need it. Moreover, it offers a link piece to the end pin, which can be fixed ultra-strong by double-sided Velcro within seconds. A great idea, which proves to be useful for guitars and non-slapped basses as well. The high-quality straps are available as 8 cm (approx. 3.1") and 10 cm (approx. 3.9") wide versions. The straps are handmade in Germany and they look pretty cool with an infinitely adjustable length from minimal 32 inches to maximal 63 inches in one step in only 5 seconds by a patented double-sided ultra-strong hook and loop system. Every instruments feels very balanced, because the 8 or 10 cm width spreads the weight very well and the ultra-thick cushioning makes even the longest gig a pleasure. The strap is free of any metal or plastic parts and out of the finest german napal leather available, double-stitched for a very long lifetime. The strap also offers a very cool cable guide (see detailed pics below), so no more cable mess on stage. For more detailed pics, please click the picture below. We know, there are countless knobs out there and the number is still growing. So we decided to not offer all the standard Strat, Tellie, Les Paul etc. knobs you can buy everywhere - we only want to offer you our favorite knobs, you can´t buy everywhere ! They are very exclusive and the most beautiful knobs we ever saw ... at least this is our opinion ;-) All the knobs are out of metal and are fastened with a set-screw, so they fill fit every standard pot with a solid or splined shaft. 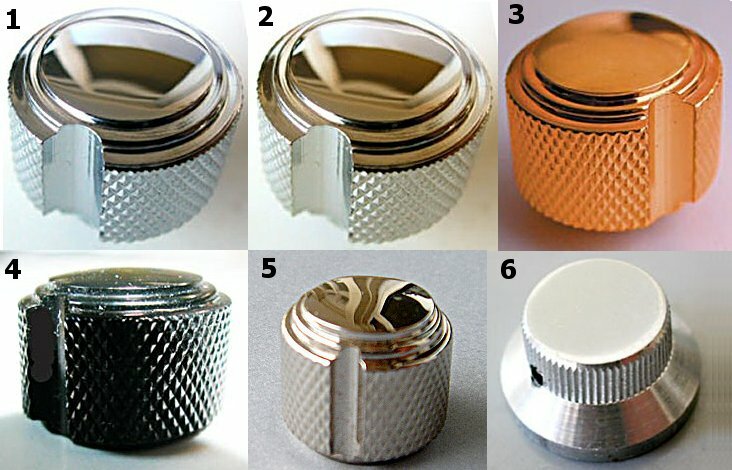 The "Jazzica" knob (pic #1 - 4) has a diameter of 22 mm and a height of 16.5 mm and is available in chrome (#1), nickel (#2), gold (#3) and black (#4). The "Little Jazzica" (pic #5) is a smaller version with a diameter of 18 mm and a height of 16 mm, perfect for any Telecaster - the "Little Jazzica" is only available in nickel (#5). 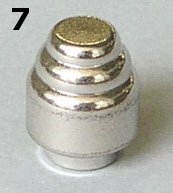 The "Jazzica" metal switch tip (pic #7) is the perfect matching soulmate for all Jazzica knobs. It´s full metal switch tip with an allen set-screw and fits all Fender-style switches and toggles. It´s only available in nickel. The "Jazzebel" Strat knob (#6) is out of aluminum and has the exact measurements of any standard Strat knob, but with a set-screw, so that you also can use solid-shafted pots now in your Strat. This is the real thing for all you Rockabilly cats out there - unused, real casino dice !!! Drilled to make the coolest looking guitar knob in the world. 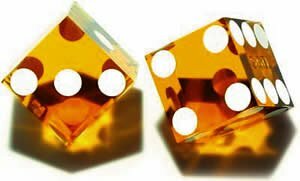 The dice are NOT stamped in any way, they are absolutely new !!! The color is called "transparent amber" and it really looks very nice. The knobs have a set-screw and will fit every metric and non-metric pot shaft. Looks especially cool on any semi-acoustic guitar and even Brian Setzer from the Stray Cats uses this dice on his Gretsch axes. The dice are available as individual pieces, so you don´t have to buy a complete set if you only need one or two of them. This small disc (25mm diameter/2mm thick) can make some fumbly things easier for you ! It´s made out of ultra-transparent lucite, precision laser-cut and designed to be glued on top of guitar knobs on push/pull pots. You know this game, it´s hard to activate your push/pull pots while playing, especially with standard Stratocaster knobs. Simply glue this disc on top of the knob, using a transparent atomic glue and you solved this problem within 30 seconds. Now you have a good grip to engage your push/pull pot and because of the ultra-transparent lucite, it´s not visible for the audience. To make it better visible for you, the edge of the disc is satin finished by hand, so you can even see it on semi-dark stages. A nice little, inexpensive and handy gadget. For even more cool guitar parts, we are proud to work with some other great companies, please see below ! We can get all the parts from this companies for you, if you need something, please let us know. 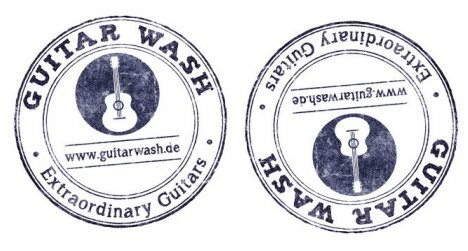 For some more great guitars, parts, effects and accessories, please visit the "Guitar Wash" webpage. This page offers a wide range of assorted things and guitars. Currently the shop is only available in German ! Because of our cooperation and friendship with the guyys from "Guitar Wash" we are able to offer the complete product palette from Glendale Guitars USA. Glendale is making high-quality hardware parts and it´s for sure the best of the best. So if you need something from Glendale, please let us know. Crazyparts is also the home of the DMC "Dead Mind Club" and they offer really cool guitar parts with the focus on aged and vintage looking accessories for Les Paul guitars, Strats and Tellies. If you need something from them, please let us know, we have access to the whole product palette. Mark from Fatboy Guitar Relic Parts is a specialist when it comes to faithful aged parts, down to the oddest details. His pickguards are really standing out and the best ones we have seen. His aging process is very realistic and custom orders are always welcome. World renowned guitarist Alexander Beyrodt offers a wide range of new and faithfully aged guitar parts from cheap up to expensive so you can dial in your own balance between price and authenticity/quality. We think this is a great idea, so check it out ! Killer Guitar Components (KGC) is based in Gloucester, MA in the USA. Rick and Sandy offer a wide range of guitar related hardware with the focus on brass parts in all variations. If you are looking for custom-made brass hardware and more, check them out.